We will be open on Wednesday, July 4th from 10 AM – 4 PM. Did you know that the signing of the Declaration of Independence was toasted with glasses of Madeira? It was the drink of choice in the 1800’s. According to Noel Cossart, in his book “Madeira, The Island Vineyard,” George Washington was purported to drink a pint at dinner daily; Betsy Ross sewing her flag and Francis Scott Key composing “The Star-Spangled Banner” sipped while they tasked. An outstanding feature of Madeiras is their ability to age for decades and even centuries. And once opened, the wine retains its freshness indefinitely; wine reps have brought tasting bottles into the shop that have been open for 9 months! Come on by for Madeira, other wines, recipe ingredients, freshly sliced cheeses or meats to celebrate Independence Day. Cossart Gordon 5 year Bual Cossart Gordon’s specialty is the medium-sweet Bual. This Bual hits all the right notes, with a richness backed up by dried figs, nuts, savory hints and a clean finish. 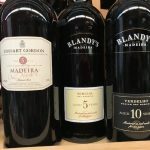 Blandy’s 5 year Sercial The driest style of Madeira, Sercial is excellent when served chilled as an aperitif with a Portuguese cheese such as Beira or Omorro Amanteigado. Or, sauté mushrooms in Sercial to create a sublime flavor combination. Sercial offers aromas of caramel with deep butterscotch, roasted nut flavors and a touch of spice. The persistent finish lasts for over a minute. 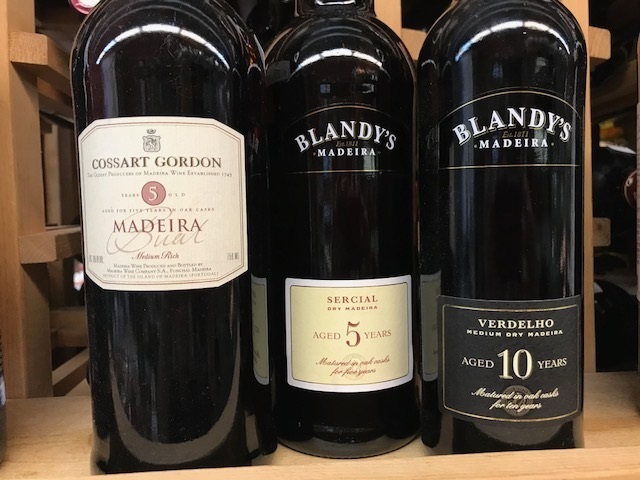 Blandy’s 10 year Verdelho Verdelho is medium-dry, infused with nougat flavors, a hint of molasses, nuances of honey and baking spices. Excellent with nut desserts. 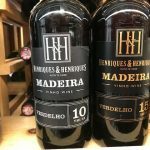 Henriques and Henriques (H&H) is renowned for its outstanding Madeiras made from the Verdelho grape. They farm 15 hectares of vineyards on Madeira, which is a huge plot by island standards; most vineyards are relatively small, family owned and scattered among terraced vineyards. 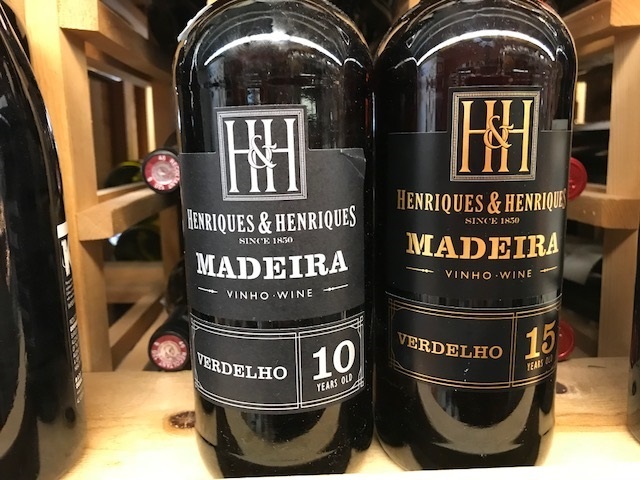 H&H 10 year Verdelho ($45.00) With buttery caramel flavors, roasted nuts, butterscotch and dried fruit, it is medium sweet with a lingering finish. Stellar. H&H 15 year Verdelho ($64.00) Shows a beautiful intensity and concentration. Notes reminiscent of Cognac wrap around a core of almonds and walnuts, fig and raisin. Medium dry with great acidity. Luscious and amazing with a seemingly endless finish. Pasta most probably came to Catalonia and Valencia with the Arabs. This particular form of pasta, fideo, is a round noodle, less than an inch long, and is not typically Italian. The Catalans in fact, claim to have taught pasta making classes during their intermittent rule with Aragón of Sicily and Naples starting in the 1200’s. The way it is cooked, in a rich broth which it absorbs, rather than in water and then tossed in a sauce, seems very Spanish to me. 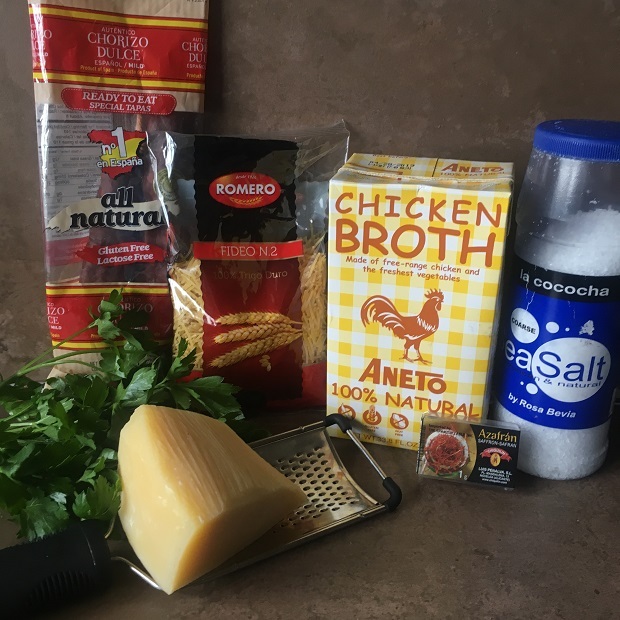 The Spanish pasta called fideo is used to make fideuá, a dish similar to paella using pasta in place of rice. Cook the ingredients together in a paella pan as described below, until the fideuá is al dente. Then run the pan under the broiler until it is crispy and golden on top. I like to serve fideuá with alioli (garlic mayonnaise) on the side for a flavor explosion. I admit it. This is only tuna noodle casserole. But it’s a variation upon the theme which will amaze and delight you. Best of all, it can be on the table in twenty minutes. Heat Olive Oil in 12 inch or larger paella pan, sauté onions and garlic until soft. Add the tuna with oil it was packed in. Add the olives and capers and sauté for one or two minutes until warm. Add pasta and return to boil. Sprinkle with parsley, lemon juice and a grind of fresh black pepper before serving. 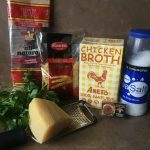 This has also been referred to as “Macaroni and cheese for grown-ups” but kids love it, too! 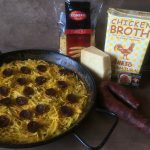 Pour the chicken stock into a 12 inch or larger paella pan. Add saffron and bring to a boil. The amount of saffron you use should depend on how much you like it and how fresh your supply is. Sniff the jar to determine the latter, go light the first time you make this recipe until you determine the former. Add pasta. Stirring occasionally, cook pasta until it is al dente and most of the liquid has been absorbed (12 minutes for most pastas). Stir in cheese, heat until it melts. For meat lovers, place very thin slices of chorizo or cooked Linguiça on top and run the pan under the broiler until surface starts to brown. *These ingredients are available at Paris-Madrid Grocery.